Tomorrow, July 21st is National Junk Food Day! This is a holiday I’ve never heard of until this year, but hey, it’s the best holiday EVER! Join us at TGI Fridays Snacks to celebrate by indulging in some of your favorite junks foods – you deserve it. I’d like to say thank you to the company for sending us some TGI Fridays snacks to enjoy for free in exchange for this post. The lineup for this special holiday includes awesome potato skin flavors such as Cheddar & Bacon, Loaded Potato and Baby Back Ribs – all dedicated to treat your taste buds and satisfy your tummy. My husband got to these snacks before I did and I guess his favorite was the Bacon Ranch Potato Skins, as I don’t think I got 1 chip and the bag is gone! LOL We tried, and yes I did get some of these, the Mac & Cheese party bites corn puffs and these are delicious! These literally taste like Mac & Cheese and you want to eat more. The Cheddar & Bacon potato skins are awesome! I got hooked on these when they first came out. 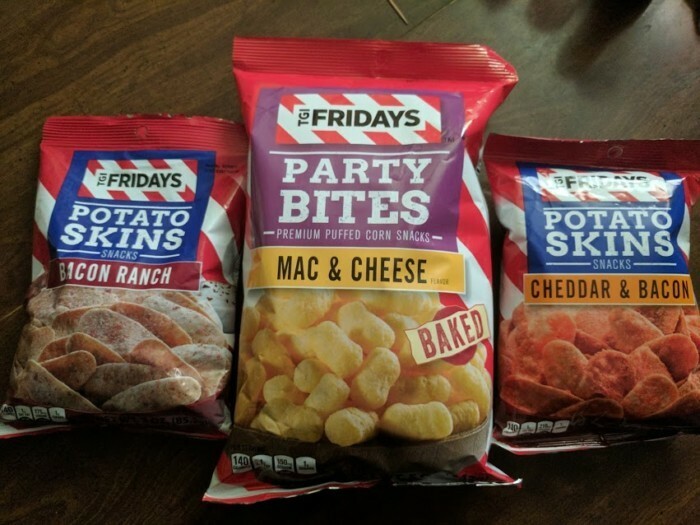 I definitely recommend TGI Fridays Snacks for party’s, movie nights or just for a snack. Over the weekend we went to the $Tree and found that they sell the TGI Fridays Bacon & Cheddar potato skins, which made me happy. I bought a few bags for my husband to bring to work with him for snacking. What are you eating for National Junk Food Day? TGI Fridays wanted to encourage more families to get together, enjoy a night together and have some Junk food fun too! They are offering one of my lucky readers 2 coupons for free TGI Friday products! Head on over here to enter. Good Luck and Hurry, only a couple days to win!